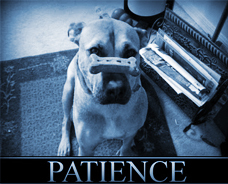 Some opposites of patience would be irritability, nagging, pushiness. One aspect of the virtue of patience is flexibility vs. rigid insistence of everything being done on time even when this is not absolutely necessary. Impatient people, such as myself, tend, really, to value order above loving compromise with the ways of others. Whereas we are never to compromise on moral truth and behavior, impatient people tend to make orderliness and efficiency about neutral matters imperative. As if, for instance, neatness was more important than kindness. I once read a novel by Anne Tyler. A woman married into a family that was dreamy and creative rather than practical. After years of chafing at the ways of her husband and the rest that seemed irrational, she realized that providence put her in this family exactly because they had such need of a person as practical and rational as she was. In the Myers/Briggs Personality Tests, one polarity is between those who tend to be laid-back trying to see what is best to choose as situations unfold vs. those who try to control outcomes through tight planning. Clearly, to be loving we need to relate to each circumstance of life sometimes very flexibly and open-endedly and at others with planning out of respect for the needs of others. In a broader context, Kierkegaard insisted that all sins come from impatience. Consider: I could be violent in action or in words because I can’t stand waiting for another to obey my will. I could lie in order to what I want without painfully waiting for something to happen in the right way. I could lie because I don’t have the patience to convince another to forgive me or to endure punishment and instead try to cover up my misdeeds. I could indulge in sexual sin because I don’t have the trust to wait for a spouse God may send or wait for fulfillment of my greatest longings in heaven. I rage at others because I hate what is happening, refusing to patiently accept the sufferings of life that I cannot change or avoid. Essentially loving patience comes from trust that, even if I cannot get what I want, God will provide what I really need on earth or in heaven. Dr. Ronda’s examples: A friend was supposed to meet me at a given time. She didn’t show up. I called and didn’t get an answer. I drove off impatiently. Ten minutes later she called. It was a misunderstanding. I exercised patient love by turning back to our meeting place to see her. A relative judged me a little harshly over an issue I thought she misunderstood. Instead of stomping off impatiently, I addressed the matter lovingly and sweetly and let it go that I couldn’t bring her around to totally understanding me. We have differences where I live about neatness. Instead of cleaning up a mess but grinding my teeth impatiently, I patiently asked if some others could help me clean up. We did it together in no time. In general, I found that I could see solutions to trivial problems that came up when I didn’t work up the impatience. I geared myself up to be patient with any glitches involved in airplane travel.